A few years ago, when articles first started appearing about the dangers of too much sitting, I didn’t take much notice. I figured it couldn’t possibly apply to me because I exercise nearly every day. And yes, I may then spend many an hour at my desk writing or watching TV in the evening, but just how dangerous could that actually be? While exercise is vital to good health, if you also spend a good part of the day sitting, it’s going to adversely affect you. The truth is that many of us spend up to 7 to 10 hours a day sitting and an hours’ workout can’t undo the harm done by this. 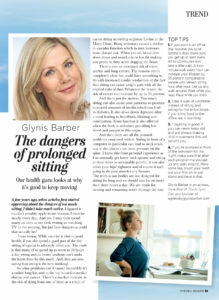 In fact, they are now saying that sitting is the new smoking! So what problems can it cause? Incredibly it’s a rather long list, and at the top is cardiovascular disease and cancer. There’s a marked increase in the risk of dying from one of these as a result of excess sitting according to James Levine at the Mayo Clinic. Being sedentary causes a decline in vascular function which in turn increases heart disease risk. When you sit, blood flow slows down and muscles burn less fat making you prone to fatty acids clogging the heart. There’s also an increased risk of colon, uterine and lung cancer. The reasons aren’t completely clear but could have something to do with increased insulin production or the fact that sitting can cause weight gain with all the implied risks of that. Whatever the reason the risk of cancer can increase by up to 50 percent. And that’s just for starters. Too much sitting can also cause your pancreas to produce increased amounts of insulin which can lead to diabetes. It also slows down digestion after a meal leading to heartburn, bloating and constipation. Brain function is also affected when the body is sedentary providing less blood and oxygen to this organ. And then there are all the postural problems associated with it. Sitting in front of a computer in particular can lead to neck strain and it also places a lot more pressure on the spine. I know this from personal experience as I occasionally get lower back spasms and sitting at these times is unbearably painful. It can also affect your hips’ tightness and of course it isn’t going to do your muscles any favours. The truth is our bodies are not designed for sitting for long periods and we should aim for no more than three hours a day. Our bodies are made for moving and remaining active through the day. If you work in an office that requires you to sit behind a desk, make sure you get up at least every 40 to 60 minutes and take a little walk. A two-minute walk every hour can increase your lifespan by 33 percent compared to people who remain sitting hour after hour. Stand while you read. Pace while you think. Be the most helpful person in the office and offer to run errands for people. Take a walk at lunchtime instead of sitting and eating for the entire break. If you bring food to the office eat it standing. Fidgeting is good. If you can never keep still and are always making little movements this will benefit you. If you’re slumped in front of the television for the night, make sure that after each programme you get up and walk around. Make some tea, brush your teeth, put your PJs on or just stand and have a chat. As someone working from home—writing and editing—I can totally relate. I try level best to take a walk daily for lunch and dinner (including walking to and from the dining place). If I don’t, my digestive system gives me warning signals.